Water scarcity is becoming an increasing challenge as water demand is growing with double the rate of population growth in the twentieth century. In September 2015, the majority of the world adopted the 2030 Agenda for Sustainable Development, consisting of 17 Sustainable Develop­ment Goals (SDGs) with 169 targets. Target 6.4 addresses water-use efficiency and wa­ter stress. To track progress, two indicators were developed. Agriculture is key to Africa’s future. The continent has most of the world’s arable land, over half of its population is employed in the sector and it is the largest contributor to the total GDP. Moreover, Sub-Saharan Africa has the largest number of water-stressed countries and it is estimated that more than 2.8 billion people on the continent will face water scarcity conditions by 2025. Therefore, governments should emphasize on improving their water resource management practices. To achieve this, good and sufficient data is necessary. As agriculture accounts for 70 percent of global freshwater withdrawals, irrigation is considered the largest water-consuming activity in the world and thus has great potential to become more water-efficient. So, how about specifying indicators 6.4.1 and 6.4.2 to enable in-depth evaluation of current irrigated agriculture practices? In light of this, the Food and Agriculture Organization of the United Nations (FAO) developed a performance indicator that links food production to its water consumption; so-called Water Productivity is defined as the ratio of agricultural yield [kg] to the amount of water that has been used (or consumed) for its production [m3]. Assessing water productivity gaps are complex tasks that include the monitoring of current levels of productivity in various crop production systems and the comparison of such levels to potential ones. Geospatial data can provide tools to monitor and visualize these processes with a high spatial variability, subsequently leading to improved decision-making. 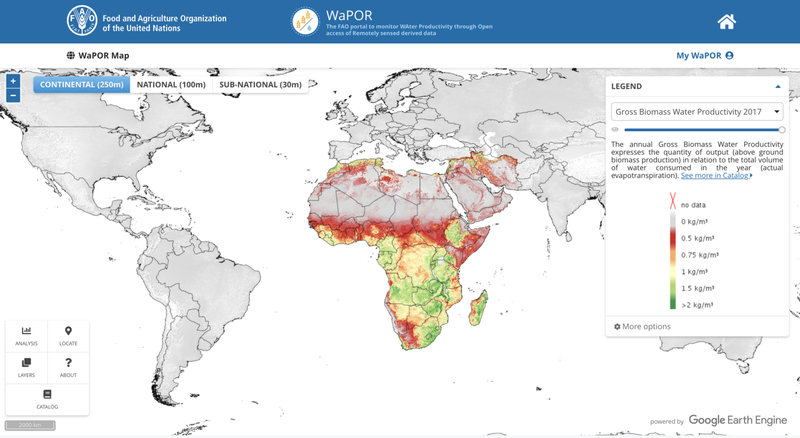 Therefore, FAO launched the WaPOR data portal that provides free and open access to processed Earth Observation (EO) data, including actual evapotranspiration (ET) and biomass production, throughout Africa and the Middle East in near real time. With the launch of the FAO WaPOR data portal, insight into the African continent regarding hydrological processes and biomass production has significantly expanded. Fresh water withdrawals can be assessed through ET data, by splitting the total ET in so-called green and blue water ET. ET from green water is the part that is derived from rainfall that infiltrated into the soil, while ET from blue water is due to the use of human-made infrastructure such as pumps, with the purpose of irrigation. So-called blue water consumption can thus be linked to indicator 6.4.2: measuring freshwater withdrawals. Blue water consumption can be derived with a framework of formulas based on the the Water Accounting+ model that was developed by IHE-Delft. However, calculating blue water consumption on a national level (large spatial scale) with high resolution (100 m) proved to be insufficient on a single device with the standardized programming methods, such as Python’s GDAL package. In addition, the variations in characteristics of the data with regards to type, resolution and region of interest was hard to work with. With Google Earth Engine, processing was possible on a high temporal and spatial scale, making it possible to provide actionable information on policy level. Fresh water withdrawals derived from ET can be calculated on a monthly basis on a national, regional and local scale with high resolution. By comparing this data with in situ and field level measurements, hot spots and anomalies in irrigation efficiencies can easily be located. Irrigated crop water productivity can be obtained by dividing agricultural yield [kg] by the total amount of blue water that was consumed [m3]. With WaPOR data, agricultural yield, as well as blue water consumption, can be derived and computed on pixel level scale. The use of EO data is a powerful and cost-effective technique to assess water use efficiency and is therefore internationally acknowledged to support SDG 6.4. As governments have a responsibility towards ensuring water security nationwide, an improvement of water productivity in agriculture should come from policy and decision-makers rather than farmers. However, it has been proven that extensive methodologies and infrastructure are needed to facilitate proper implementation of EO to support policy and decision-makers. It is crucial that local political organizations are informed and encouraged to implement geospatial efforts in their respective countries. Without their involvement, much of the derived data and information will remain in the field of science and research. To reach end users, the actors, the playing field and the tangible contribution of EO in relation to the SDGs need to be identified. Tools and (preprocessed) data sources such as Google Earth Engine and the FAO WaPOR portal provide the capacity and framework to bridge the gap between policy and technology. However, there are still challenges to overcome.